As the Chief Instructor 7th Dan and founder of Shotokan Karate Budokai, it is my great pleasure to welcome you to our club. 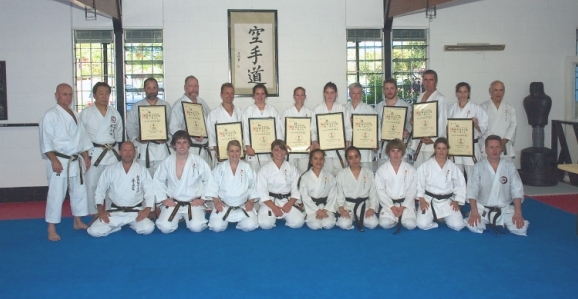 At Shotokan Karate Budokai we take a modern approach to training that is both progressive and varied whilst maintaining authentic Shotokan instruction. S.K.B. was formed in 1985, with it's main objective being to promote and teach traditional Japanese Shotokan Karate, that is spirited and strong. The wisdom and confidence gained from these solid foundations can then be applied in the art of self defence and competitive sport. Our training is taken very seriously, however we always maintain a friendly and comfortable atmosphere on and off the Dojo mat. New members are important to us and are always made to feel welcome and at ease. In the words of the founder of the modern day Karate - Ka Funakoshi Gichin "Do not forget the spirit and humility of a beginner"
If you are interested in learning more about Karate or, would like to continue your training at our full time studio, do not hesitate to contact Sensei Trevor Roberts by phone or email.